The Museum of Illusions has just opened up in Dubai Old Town a few days ago, and we’ve already seen dozens of mind-bending illusion images from the place. From a ‘spinning’ vortex tunnel to upside down rooms, get your camera ready and head there to see it for yourself. Ever played a game of glow in the dark mini golf at Tee & Putt? It’s a super fun boredom-busting activity, especially if you like some friendly competition. Up for another challenge? Tee & Putt also has a fun team game that combines escape rooms and mini golf! You’ll have 60 minutes to solve 9 puzzles and score 9 holes to complete the game. Good luck! Looking for a super cool Dubai experience to try? This seaplane adventure will take you on a boat ride across the Creek before jetting off in to the sky for an incredible aerial view of our city! Sounds awesome? It definitely it, but it comes at a price. Seawings Dubai has quite a few tours to choose from, including trips to the capital – check them out here. Even though this gold frame-shaped structure is the newest landmark in Dubai, you’ll find the Dubai Frame in Dubai Old Town – just at the edge of Zabeel Park. Once you enter, you’ll be able to see panoramic views of both Old Dubai and New Dubai, discover Dubai’s past and get a glimpse into the future! If you haven’t seen it yet, the award-winning IMAGINE show is definitely worth checking out – and it’s completely free to watch! There are two epic light, water & fire shows that take place daily at Festival Bay. We suggest getting a table at one of the fountain-facing restaurants to enjoy your dinner with a show. 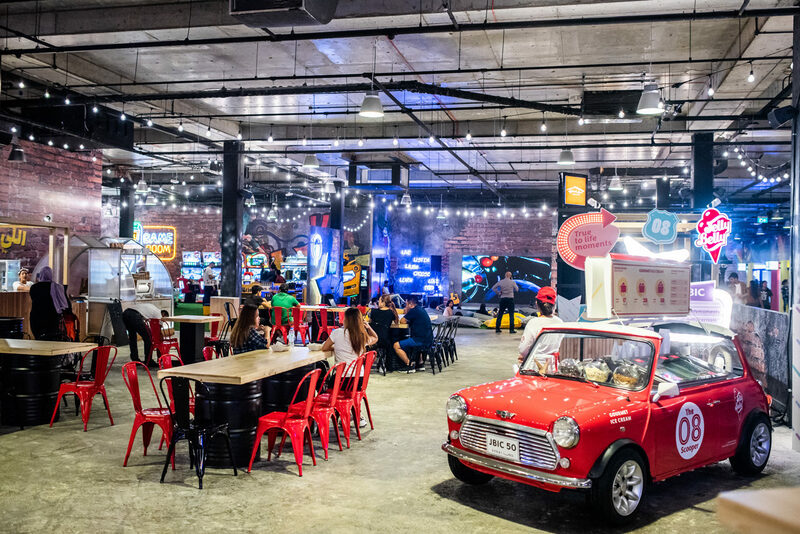 Whether you fancy shopping at pop-up stores, trying some delish street food, enjoying the live entertainment, watching a movie, singing at the karaoke stations or playing arcade games – you to check out INDOORS at Deira City Centre! This brand new indoor hangout has fun for all ages, and is a great way to beat the heat. Want to spend the day hanging out with dolphins? You totally can. Just make your way to the Dubai Dolphinarium at Dubai Creek Park. You’ll be able to meet them, greet them and swim with them too! A super fun water activity for all ages. If you’re on a tight budget, this is probably one of the cheapest things to do in Dubai Old Town! Hop on to an abra and the Bur Dubai or Deira abra stations and enjoy the ride across the Dubai Creek. The views are incredible, and it will only set you back AED 1! Fancy challenging your friends to a game of bowling? At Al Nasr Leisureland, you can go bowling while enjoying drinks too! On top of that, they’ve also got an ice rink, a gaming room, squash courts and more. From zip-lining through the trees to gravity-defying obstacles and more, Aventura Parks is an insane adventure park that everyone needs to try at least once! The park took a short break for summer, but will be reopening on October 1st!